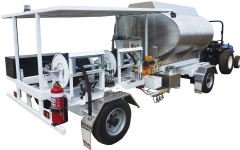 Our range of trailers for JET and AVGAS are fully compliant and have approvals for registration as Dangerous Goods Vehicles within any State or Territory of Australia. 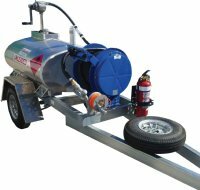 The range comprises 1000, 1500 and 2000 litre capacities with both 12/24v DC or higher flow units powered by Diesel engine. We also build a wide range of custom units for airside or private property use only, these range from 300 litre to 10,000 litre. Any capacity unit can be built and supplied with DG Approvals for public road use if required. Some Notes: If you require a vehicle to be licensed to travel on public roads whilst transporting Class 3 Flammable Liquids (ULP, AVGAS, JET-A1) then the vehicle must have a Dangerous Goods Approval number - this is NOT a UN or ADR number. The registration as a DG vehicle is separate and additional to the normal road registration. At this time, no self-bunded tanks/trailers would be acceptable as an Approved vehicle. Call 1800-025 869 or email sales@fuelequipment.com to discuss your requirements.